Yamanashi Prefecture (山梨県, Yamanashi-ken) is a prefecture located in the Chūbu region of Japan. The prefecture is landlocked, featuring a fertile central valley, the Kōfu Basin, surrounded by many of the highest mountains in Japan including the highest, Mount Fuji located on the southern border with Shizuoka. As in most other Japanese regions, prehistoric society in Yamanashi progressed though the hunting, fishing and gathering stage of the Jōmon period, then the rice-producing stage of the Yayoi period and subsequent village and regional formation. The Maruyama and Choshizuka Kofun (earthen burial mounds) located on Sone Hill of Nakamichi Town (Southern Kōfu) are believed to have been built from the end of the 4th century. From these remains it can be assumed that the people of Sone Hill had great influence. Among the many Kaigenji generations, those of the Takeda, Ogasawara, and Nanbu families were particularly prosperous. During the Sengoku period of the 16th century, Takeda Shingen attained the status of daimyō and built Tsuzuji Mansion and the Yōgai Castle in Kōfu. From this base, he attempted to unify and control Japan. After Takeda's death in 1582, Kai-no-Kuni came under the control of the Oda and Toyotomi clans before being subsumed into the Tokugawa shogunate during the Edo period. Beneath the Edo shogunate, the Kōfu clan (based in Kuninaka, or Central and Western Yamanashi) and the Yamura clan (based in Gunnai, or Eastern Yamanashi) were formed, but in 1724 the area came under the direct control of the Shogunate. 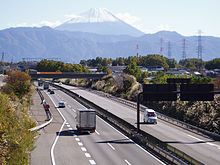 With the development of the Kōshū Kaidō (highway) and Fuji River transport, goods, materials and culture flowed into the region. By the mid-19th century, the contradictions of military government and clan system caused stability to erode and resistance to erupt across Japan, paving the way for the Meiji Restoration of 1868. During the Boshin War, the Battle of Kōshū-Katsunuma on the 29 March 1868 was a significant battle between pro-Imperial and Tokugawa shogunate forces immediately prior to the Imperial Forces march on Edo Castle. Preceding the Kōshū-Katsunuma battle, Kōfu Castle had been captured by troops loyal to the Emperor Meiji. 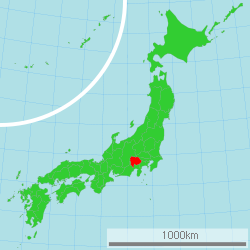 The province was renamed Kōfu Prefecture in 1869 and then Yamanashi Prefecture in 1871. The anniversary of this event on November 20, 1872, is now celebrated as Prefectural Citizen's Day in Yamanashi. In the early part of the Meiji period (1868–1911), industrial promotion policies furthered sericulture, silk textile production and wine making industries. In 1903, after seven years of construction, including the building of a nearly three mile long tunnel at the Sasago Pass, the Chūō Railway Line from Hachiōji and central Tokyo finally reached Kōfu. The reduced journey times to the capital and the port of Yokohama brought significant change to local industry and culture. Agricultural production in farming communities was still on a small scale at the turn of the century and land reforms had yet to be introduced. From the 1920s however, tenancy and contract disputes between landowners and farmers in Yamanashi grew increasingly common. The capital city, Kōfu, suffered extensive damage during a major air raid on the night of 6 July 1945. From 1945 onwards, as part of economic initiatives introduced under the post war Government of Occupation, agricultural land reforms significantly increased the number of individual farms and promoted fruit farming and viticulture throughout the prefecture. At first with limited success in 1946, but on a much more sustained basis in 1951, dairy farming, introduced by American Paul Rusch, became a feature of highland pastures surrounding the town of Kiyosato. Small scale manufacturing industries and commerce grew at rapid speed during the expansion of the post-war Japanese economy. The 1982 opening of the Chūō Expressway also led to significant growth in service industries, transport logistics and tourism. In common with many similar sized cities during the 1990s, rapid growth in car ownership, out of town shopping, and improved transportation links to Tokyo, caused a drop in commercial activity and land values in the center of the prefectural capital Kōfu. To counterbalance this trend the prefectural government launched a city center revitalization plan in 2008, promoting downtown tourist attractions such as redeveloped land North of Kōfu station, Maizuru Castle Park and new residential, cultural and government office facilities. 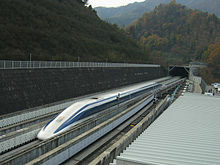 Planned changes in transportation infrastructure also promise to significantly impact the Yamanashi economy in the coming decades; under mountains in the eastern part of the prefecture is a completed 42.8 km section of the SCMaglev test track, a section of the planned Chūō Shinkansen. The maglev line is designed to ultimately connect Tokyo, Nagoya, and Osaka with a station also planned to the South of Kōfu. Central Government permission to proceed with an extension to the existing test track was granted on May 27, 2011. At the end of 2013 construction was already well advanced as far as Fuefuki. 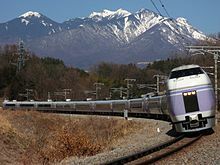 JR Central is considering opening a demonstration service from a new station in Kōfu by the 2020 Summer Olympics so that visitors can also ride on the experimental track through the Yamanashi mountains. 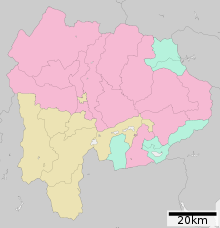 Yamanashi Prefecture is bordered by Tokyo, Kanagawa Prefecture, Saitama Prefecture, Shizuoka Prefecture, and Nagano Prefecture. The prefecture is landlocked, with high mountains surrounding the central Kōfu Basin. Mount Fuji and the Fuji Five Lakes region is located on the southern border with Shizuoka. Mt. 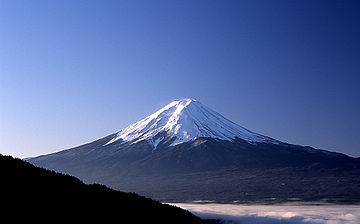 Fuji provides rain shadow effects, and as a result, the prefecture receives only about 818 mm of rainfall a year. 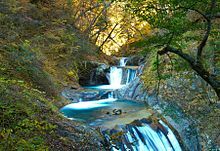 As of April 1, 2012, 27% of the total land area of the prefecture was designated as Natural Parks, namely the Chichibu Tama Kai, Fuji-Hakone-Izu, and Minami Alps National Parks; Yatsugatake-Chūshin Kōgen Quasi-National Park; and Minami Alps Koma and Shibireko Prefectural Natural Parks. 78% of the prefecture is covered by forests, making it one of the most densely wooded prefectures in Japan. Land cultivated for agriculture is mainly restricted to the lower elevations of the Kōfu basin. Yamanashi has a sizable industrial base in and around Kōfu city, with jewelry and robotics industries being particularly prominent. The headquarters of FANUC, the leading global manufacturer of factory automation systems, is based in Oshino in the south of the prefecture. The prefecture is also host to numerous fruit farms and vineyards. Yamanashi is one of the major fruit producing regions in Japan, being the top domestic producer of grapes, peaches, plums, as well as wine. In addition, roughly 40% of the mineral water bottled in Japan comes from Yamanashi, mainly from around the Southern Alps, Mt. Fuji, and Mitsutōge areas. The quality of the water sources in the Southern Alps prompted Suntory Group to open the Hakushu distillery in the northern Yamanashi town of Hokuto. 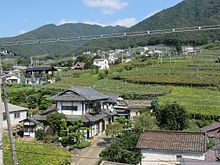 The natural scenery and cultural sights of Yamanashi are popular destinations for both domestic and international tourists due to the prefecture's proximity to the crowded Tokyo conurbation and ease of access by road and rail. Mount Fuji, the Fuji Five Lakes region, the highland resort region of Kiyosato, the city of Kōfu, the Senga Falls, Koshu wineries, the temple of Erin-ji in Koshu, and the Kuonji Temple at Minobu are a few of the most popular places to visit. The Fuji-Q Highland amusement park at Fujiyoshida with roller coasters Eejanaika, and Takabisha, the world's steepest roller coaster, is also a popular destination for day trips. Although not as tall, Mount Minobu, a popular place for Buddhist pilgrimage, offers extensive views from the summit of the mountain. 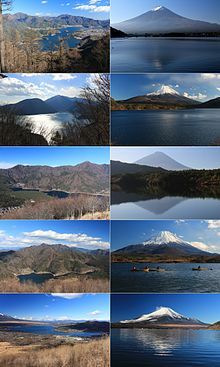 Parts of the Fuji-Hakone-Izu National Park, Chichibu-Tama-Kai National Park, and Minami Alps National Park are all located in Yamanashi. Given the area's volcanic activity, natural hot springs, or onsens, are found in abundance. Some of the more well known are Shimobe Onsen, Isawa Onsen and Yamanami Onsen. Shingen Festival, held each March in the precincts of Kōfu Castle and Takeda Shrine in commemoration of Takeda Shingen's role in prefectural history. Ventforet Kōfu the J. League Division 1 association football (soccer) team is based in Kōfu. The team's home ground is the Yamanashi Chuo Bank Stadium. Since 2005 the Fujizakura Country Club in Fujikawaguchiko has also hosted the Fujisankei Classic golf tournament, an annual event on the Japan Golf Tour. ^ Ericson, Steven (1996). The Sound of the Whistle: Railroads and the State in Meiji Japan. Harvard University Press. p. 46. ISBN 0-674-82167-X. ^ Smethurst, Andrew (1986). Agricultural Development and Tenancy Disputes in Japan, 1870-1940. Princeton, New Jersey: Princeton University Press. p. 367. ISBN 0-691-05468-1. ^ Ijiri, Toshiyuki (1991). Paul Rusch. Cincinnati, Ohio: Forward Movement Publications. p. 167. ^ Ishiguro, Kana (December 8, 2002). "There's cows in them there hills". Japan Times. Retrieved 25 October 2014. ^ "中央新幹線（東京都・名古屋市間）計画段階環境配慮書の公表について" (PDF). Central Japan Railway Company. Archived from the original (PDF) on 13 June 2011. Retrieved 8 July 2013. ^ "リニア山梨県駅、東京五輪前に　体験乗車に道 ＪＲ東海が検討". 日本経済新聞. 14 January 2014. Retrieved 14 January 2014. ^ "General overview of area figures for Natural Parks by prefecture" (PDF). Ministry of the Environment. Retrieved 25 April 2012. ^ "2008 Yamanashi Ken no Aramashi" (PDF). Yamanashi Prefecture. Yamanashi Prefectural Government. Archived from the original (PDF) on 24 September 2015. Retrieved 1 November 2014. ^ "FANUC History". FANUC Europe Corporation. Retrieved March 19, 2014. 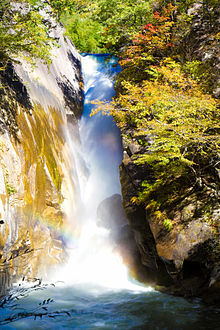 Wikivoyage has a travel guide for Yamanashi.